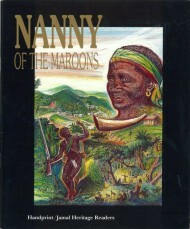 Nanny of the Maroons. Jamaica's first National heroine. Introduce your family to these beautiful sets of books with facinating profiles of key black figures in Jamaica’s history. The real story of NANNY OF THE MAROONS, SAM SHARPE, and PAUL BOGLE, illustrated by top artists including Wilfred Limonious the famous Reggae LP cover designer. Get these 5 books – Arawaks, Nanny, Tacky, Sam Sharpe and Paul Bogle for £10.00. Also get a set of Rocky Basic Reading books – Rocky the Woodcarver, Rocky’s Village, Rocky’s Tour, Rocky’s Heroes, and Rocky’s Top Ten. These books introduce aspects of Jamaica’s life and culture, and are ideal for both adults and children. Get the 5 Rocky books for £10.00.